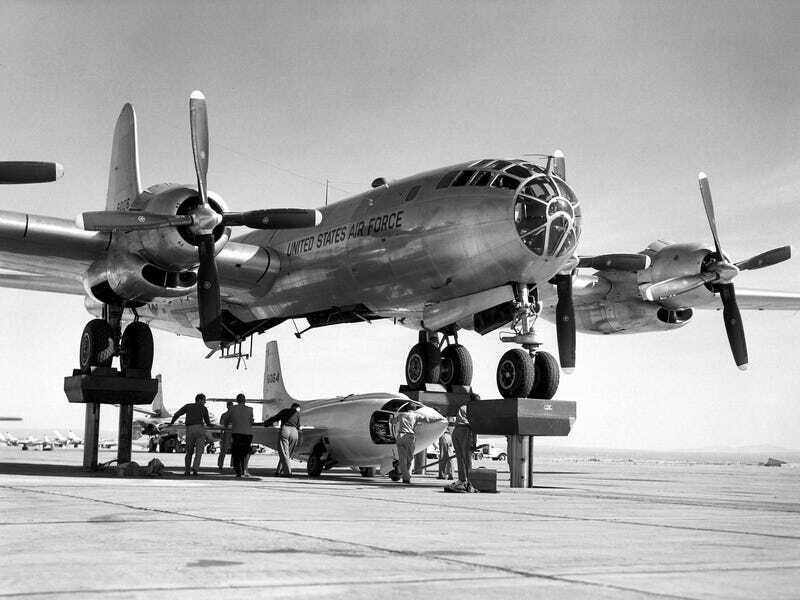 In this dramatic photograph, we see the third X-1 being mated to its B-50 Superfortress mothership. Before the jacks were installed, they used a pit dug in the runway and then (presumably) backed the mothership over top of the X-1, as shown in the next photo. But then they installed these awesome hydraulic jacks to lift the mothership up, and we can see in the photo how the system was used to mate the Bell X1-E to its B-29 carrier. But none of this is what bugs me. What bugs me is a detail in the top photo. In the background is a North American B-45 Tornado. But what happened to the starboard wing? The engine cover is open, so I guess it’s possible to assume that the wing has been removed. And we can’t see the port side to see if that wing is there or not. It’s always been somewhat of a puzzle to me. See? No wing. Therefore, I think the only reasonable explanation to all of this is that all of these pictures were altered, and that the entire X-1 program was a hoax.